The recent surprise announcement of Sony's a7 Mark II had people reeling about the first-ever 5-axis in-body stabilization on a full-frame camera. We recently got our meathooks on one of the new cams and wanted to show you just a bit of what it can do before giving it a more comprehensive report. 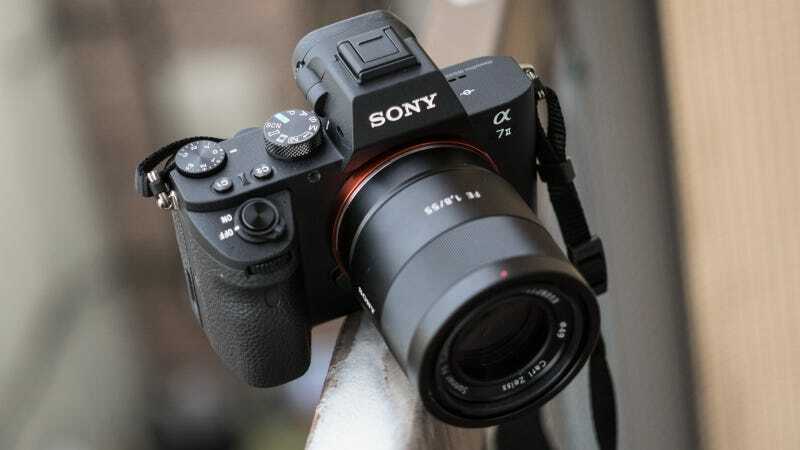 Sony's announcement of the a7 Mark II was surprising because many had previously thought it impossible to engineer the complex mechanism of 5-axis stabilization into a compact full-frame body like the a7. Sony managed to pull it off, not only astutely engineering the capability to compensate for x-axis, y-axis, pitch, roll, and yaw movements, but doing it without negatively affecting battery life. Amazing. Needless to say, being able to shoot at such slow shutter speeds is a huge advantage. Personally, when shooting with a 50 0r 55mm lens, I would never venture below 1/80 of a seond if I wanted crisp shots. Users of Olympus or Panasonic micro four-thirds cameras know how handy 5-axis stabilization is, and now it is available on a full-frame camera. My last quick test was to see the difference 5-axis stabilization made when shooting video. I did the same handheld shot as before, switching the Steadyshot from off to on. The results are mixed. While there is a marked improvement, there is still a very noticeable trace of micro-jitters throughout the clip. This is a disappointment, as these minuscule tremors are the most distracting part of hand-held footage. I will have to perform more tests to see if the Mark II's stabilization is more useful in other situations. A note on the video clip below: I didn't have a card capable of recording to the new X-AVCS codec feature in the Mark II, so the quality of the AVCHD footage is pretty bad. I will do an assessment of the true video quality in a future post. I'll be using the A7 Mark II more in the coming days and will circle back with a more filled-out set of field notes to share. But already the camera feels great, more solid and comfortable than the original A7. Keep your eyes peeled for more Mark II goodness on Reframe!